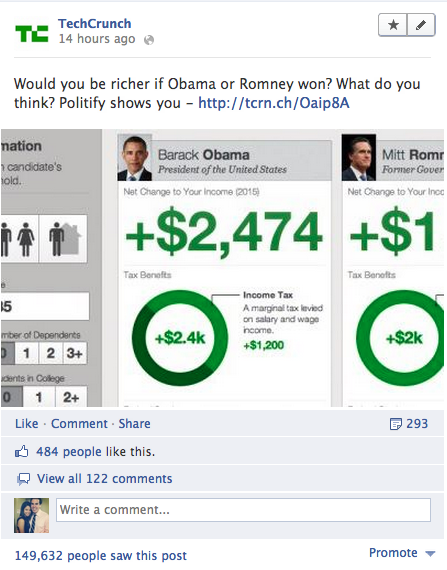 Pagelever, a popular Facebook analytics company, released a new, free tool called Minilytics today. The company claims it is the first tool that lets users measure how many fans see their posts on Facebook pages. Previously, page owners could not measure a post’s fan-specific reach because when Facebook reported post views, it didn’t separate fan views from non-fans. The TechCrunch Facebook Page only shows me how many people saw the post, not how many fans (people who “like” TechCrunch) saw it versus non-fans. Pagelever co-founder Jeff Widman tells me that changed two weeks ago when Facebook released a new metric in the API that counts fan’s post-views. Widman says the tool lets users see which page views are from fans who have already “liked” the page, rather than combining fan views with those that come from viewers who land on the page but aren’t fans. He notes that this data is particularly important for pages that are growing quickly or that have large numbers of targeted ads, citing statistics that the average Facebook page reaches only 16% of their fans each week. He favorably compares the capabilities to traditional marketing methods, saying properly timed posts can be more effective than emailing the same content to large lists of subscribers. “Okay we have a lot of Facebook fans, now what? Are my fans worth anything? Let’s look at this,” he explains. Pagelever, founded in 2010, is a Facebook preferred marketing developer; it helped YouTube become the fastest growing Facebook page in the early days of pages. Minilytics is the only free service offered by the Y Combinator-backed company.